What’s with this year’s Oscars with jazz drums? Even not straightly a musical genre, through a long journey as Hollywood’s 2012 ‘Black List’ to 2013’s Sundance’s acclaimed shorts and then becoming a feature, Whiplash’s mastermind Damien Chazelle (also wrote ‘Grand Piano’ which blended music and thriller) has made its plot closer to a psychological thriller, but with a solid jazz blend. Psychological approach between a harsh drill sergeant and his young trainee is also not new in film context. From ‘An Officer and a Gentleman’ to ‘Training Day’ and the hauntingly memorable ‘Full Metal Jacket’ has been there. But being different, Chazelle, who was inspired from his personal experience as the part of high school music ensemble in Princeton, projected jazz drums into an extreme sport with adrenaline pumping over bullying issues and misconducted education. Crafting it as a whole fresh idea, no wonder if ‘Whiplash’ got rave reviews, even harsh critics still come from jazz experts to drummers. Then again, as a movie, this is very relative depends on various point of view. 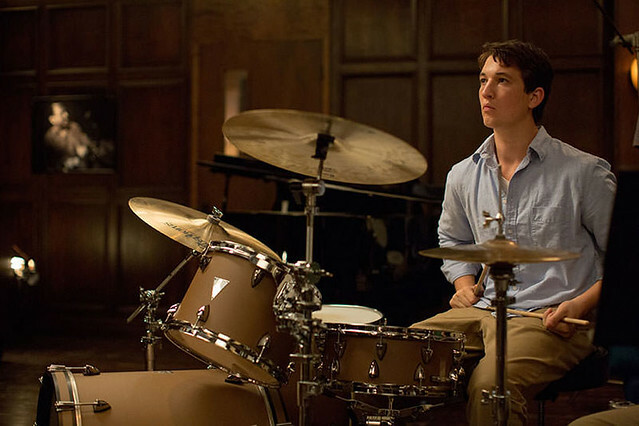 Getting into the prestigious Shaffer Conservatory, New York, a young and talented drummer Andrew Neiman (Miles Teller) didn’t need much time to drew attention from Terence Fletcher (J.K. Simmons), an old-crack conductor of a jazz ensemble and influential person in recording business. Entered the ensemble as a replacement to a core drummer Carl Tanner (Nate Lang), Neiman later realized Fletcher’s way to push his best ability is far from what he’s imagined. The psychological warfare between these two is on, breaking the wall of each ideology. Not that Chazelle didn’t made his genious script with reference and respect to the music genre, no. Like the title, referring to the title of Hank Levy’s classic jazz number that also related to its main premise, ‘Whiplash’ also has other legendary ‘Caravan’ from Juan Tizol and Duke Ellington as the strongest core to the whole ensemble’s music partitures. 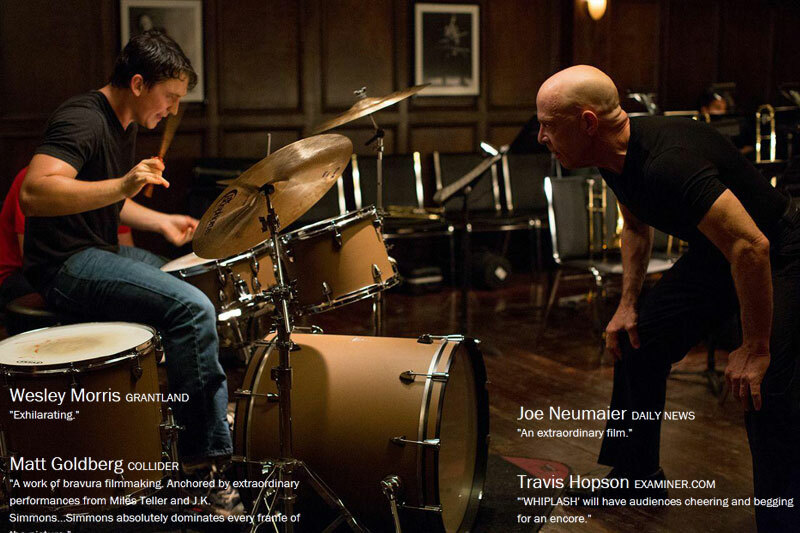 With these compositions, Chazelle aimed drum skills as his main conflict, in the matter of speed and tempo as two main conditions every professional drummer should have. There, Chazelle also packed another jazz reference from big names such as Jo Jones, Charlie ‘Bird’ Parker and mostly Buddy Rich, a legendary jazz drummer known famously for his speed-play, and some historical background about their carreer. Okay, the historical tale about Jo Jones that almost decapitated Parker’s head with a drum cymbal, what made Parker became Bird, might not be as accurate, also some protest that consider Buddy Rich is not overall received that big recognition and other characters’ relevance in terms of musical genre, but these were obviously a choice of Chazelle as a storyteller. Clearly, Chazelle wasn’t look like betraying its own genre. The bombastic attempt to push the intensity of the psy-war was another thing, that every drummer should’ve known. But call it necessary roughness, what Chazelle did with the goryness in drum practicing, which happened to work for those intentions, by any means, not being far different than what Sylvester Stallone did with boxing in ‘Rocky’ franchise. It’s often hyperbolical, but in terms of cinematic dramatization could be very much relevant. And way beyond the smart dialogues, full of punchlines, too, Chazelle’s script has great relevance to the subplot and side characters, ones that played by Glee’s Melissa Benoist, Paul Reiser, Nate Lang and Austin Stowell, which successfully built the significance among their existence, making the pace moved as fast as the drum speed along with adrenaline pumping which in jazz, almost like an inversion. On the other hand, this made us realize that Chazelle really knows music and thoroughly can translate the music, mostly its drum elements, into film language. Presenting the right play of an ensemble might not be as difficult as building detailed mistakes, to talk deeper about rushing and dragging in drums technique, along with the tempo-errors and other aspects. But with his team, mostly the sound mixing department, director of photography Sharone Meir and editor Tom Cross, Chazelle succesfully handled these matters into a perfect musical scenes. Every ear that has more ability to spot musical details must have known that level of difficulty in scenes-building. And there, the emotional intensity really had the right setups to be blown at anytime. 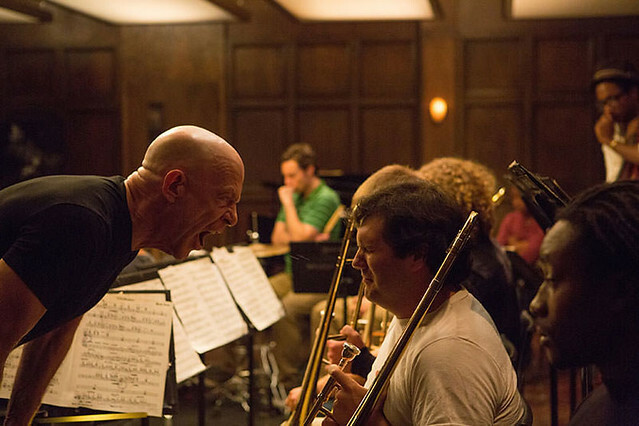 However, the best highlight in ‘Whiplash’ was obviously J.K. Simmons. Playing Fletcher over a very detailed character design includes gestures, voice and costumes, the astounding intensity of his acting, unpredictably wild and nerve cracking at times, was a perfect treat. Even just in seconds, with that shake of the head conducted the ensemble, he made us easily believe that he was really a professional conductor. This also went with fine contrasts to Neiman’s character, played beautifully strong by Miles Teller, in his first right use in movies. The intensity of their chemistry was really an ace, making ‘Whiplash’ whiplashed. So, there might be many movies about mentor vs protege’s psychological warfare, also jazz elements as a strong background. But playing it like a metronom in the right tempo, setup every conflict so psychologically thrilling, through the hell and back and ready to be blown at any times, without ever being predictable to the closing scene that has more depth than you could ever imagined, just like jazz, it’s improvising. Mesmerizing, astounding, exhilarating, electrifying or anything you want to mention. 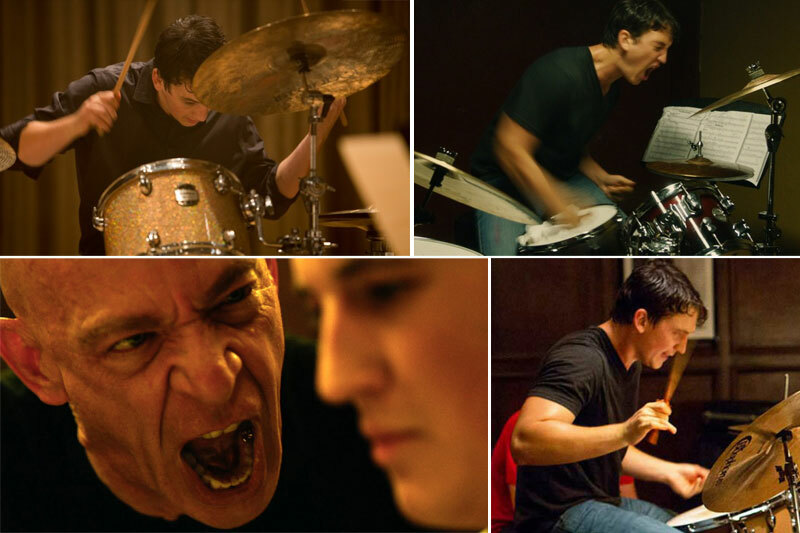 ‘Whiplash’, in every pounding rhythm of its drum beats, is a one of a kind-extraordinary masterpiece. Masterpiece. Position: Reporter/Writer | DOB: September 5 | Occupation: Dermatologist, Movie & Health Journalist | You like Jazz because: It Flows and Improvized. Just Like Life. | Motto: A Life Lived In Fear Is A Life Half Lived. A Jazz Played In Fear Is A Jazz Half Played.